Arrested during a demonstration he led on 19 October 2013 to commemorate the second anniversary of the Third Papuan Congress. He has been charged with conspiracy to commit treason. On 19 October 2013, 29 demonstrators, including 6 women, were arrested and detained for several hours in Biak Regional police station for their participation in a demonstration commemorating the second anniversary of the Third Papuan Congress. All but one were released after they were forced to sign a statement declaring that would not carry out any political activities. Piethein Manggaprouw, who led the demonstration, continued to be detained and was charged with conspiracy to commit treason under Articles 106 and 110 of the Indonesian Criminal Code. According to reports from local human rights investigators, he has been denied food, with prison authorities giving him only one meal a day. This had reportedly severely affected his physical health. On 17 April 2014, the Public Prosecutor demanded a seven-year prison sentence for Manggaprouw. On 28 May, Manggaprouw was sentenced to two years’ imprisonment after being found guilty of conspiracy to commit treason under Articles 106 and 110. However, whilst in detention, his prison sentence was increased from two to three years following a court decision of an appeal launched by the Prosecution. 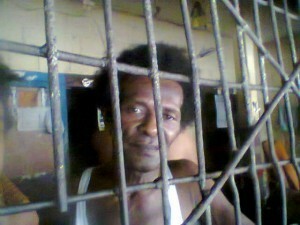 Five prominent Papuans remain behind bars for their peaceful involvement in the Third Papuan Congress on 19 October 2011. Forkorus Yaboisembut, Edison Waromi, Dominikus Surabut, August Kraar and Selpius Bobii are serving three-year prison sentences for treason.